This is probably one of the most entertaining casual game that I have played on the iPhone by developers Freeverse Inc. Although bowling games have been a dime a dozen in the world of gaming for a considerable amount of time, only the Nintendo Wii could manage to capture the realistic nature of this game. Thankfully Freeverse Inc. has managed to use the innovative controls of the iPhone to create a unique and entertaining bowling experience on this clever little smart phone. Offering two modes of play that include free play for a quick game or versus that allows you to play against the AI or other players and Flick Bowling has everything you need for that true authentic bowling experience. Best of all, the developers have managed to capture the atmosphere of the bowling alley to truly draw you in. The gameplay is quite ingenious on the iPhone and all you need to do is select your ball from three, move your bowler left or right and then start bowling. Once you have lined up your bowler, all you need to do is flick your finger up the screen and this will mimic a real world shot. 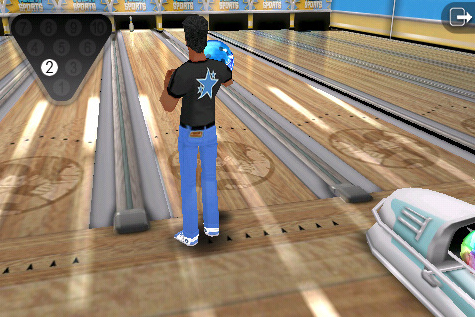 Another interesting aspect of the game is that you can also control the ball once you have bowled by moving your finger on the screen in a certain direction. This will then move the ball in that direction to a certain extend. Needless to say it works quite well as you aim for those sometimes elusive strikes. Graphically, the title is visually quite reminiscent of a bowling alley with that authentic look and feel. The characters are well animated and there are some great uses of lighting in the game. Add in all the sounds from the bowling alley and it's easy to get lost in this fun and entertaining bowling game. 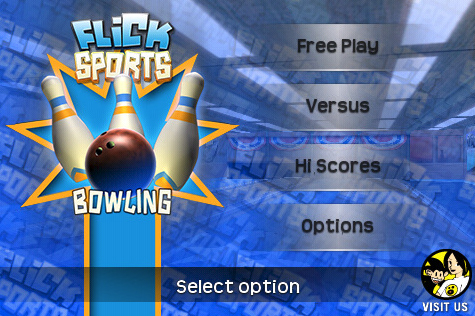 At the end of the day, Flick Bowling is the perfect casual game that can be played almost anywhere, whether a short session by yourself or a multiplayer epic, the choice is yours. Definitely a game that you will keep coming back to ... again and again!